When the doctor began to speak, I knew something was very wrong. In June of 2014, my husband and I found that our baby had a condition that was incompatible with life: arthrogryposis multiples congenita. This website helped me feel less alone during the weeks that followed. I’m sharing our story in hopes that it may help someone else experiencing a similar situation. That horrible Wednesday had started out great. My two year old daughter had an allergy appointment and, unlike her older brother, her tests came back with no allergies. No more Epipens! I dropped the kids off at my mom’s before heading off to the clinic for my 12-week ultrasound appointment. Although our OBGYN had picked up a heartbeat a week before, for some reason I had been a little uneasy about the appointment the night before. I went through the paperwork and headed into the heavily equipped room, at that point excited to get some more pictures to show off to our families. The technician was chatty as first, but after a while became quiet. She asked me if anyone in our families had club feet. I told her no. She printed off a few pics and I waited for the doctor, trying to remain calm. When the doctor began to speak, I knew something was very wrong. He positioning of our baby’s legs, crossed and unmoving, was very unusual. He also was concerned about our baby’s arms, particularly the way his one hand was angled. These were indicators of arthrogryposis multiples congenita and our baby had very severe symptoms very early in pregnancy. The joints and muscles were abnormal. The doctor told me that given the severity, we may want to consider terminating the pregnancy. I felt numb. This was our third, and probably last, pregnancy. How could this be happening? I had done everything right – I never drink or smoke and was taking prenatal vitamins. I tried to talk to my husband but I burst into tears on the phone, so the doctor took the phone and explained it to him for me. My husband rushed over to the clinic to join me. When my husband arrived, the doctor performed another ultrasound to show him the anomalies. Over an hour had passed and our baby’s legs had not moved at all. We were told that we should book a follow up appointment in one week, but to expect our baby’s condition to worsen. We left the appointment with the understanding that our baby would probably not survive. We drove home and sat on the couch. I didn’t know what to say or do. The idea of ending a pregnancy was foreign to me, as was continuing a pregnancy that would end in death. My husband and I discussed the possibilities and decided that we didn’t feel it was fair to our baby to know only suffering. Our baby wasn’t able to move. The next morning I called my OBGYN, who confirmed that the most likely outcome for our baby was stillbirth. As she had delivered our first two children, hearing her confirm the news was horrible. It’s what finally made it real to my husband. We decided that we were most comfortable with induction and delivery, but given how early we were in pregnancy, it seemed this was much riskier than a D&C. We made a list of questions and waited for an excruciating week. The following Tuesday morning, my husband and I went in for our follow-up ultrasound. In addition to the issues identified the week before, which were still present, this time the doctor found a more concerning problem: our baby’s spinal cord was damaged and bent. Even with my untrained eye, I could see that things were not right. In addition, the organs were all scrunched together. Our baby had system-wide issues that were so severe no one could give us any solutions on how they could be treated if our baby survived delivery, which was doubtful. My husband and I were relieved that she, someone we knew cared for us and understood the situation, would be able to do the procedure. The next day, my OBGYN called and said she had received some push back from the hospital to do the procedure. I was told it is very rarely done at a hospital with a live fetus. She gave me the name of a referral, a colleague who could do it at his clinic. She assured me my experience would be better there and that no one would be uncomfortable with my decision. I was devastated. I called my husband in tears and he came home. We went in to sign another form for another doctor. We again had to sign that we were aware of the possibility of adoption. I was angry there wasn’t a form that was applicable to our situation. I was angry at our doctor and I was angry at the hospital. Due to a holiday weekend, I wasn’t able to speak to the new doctor until the following Monday. He helped explain to me that the procedure could only be done in a hospital if there were “universally identifiable” or “universally lethal” symptoms. Given the information we had been provided the week before, I still do not completely understand why we didn’t meet the “universally lethal” symptoms. Even so, I was scheduled for a D&C at the clinic on Wednesday. The day we had been dreading came. When we arrived at the clinic, I wanted to run away. We have been fortunate to always have access to great health care and this place looked low budget. The clinic was on the lowest level. At least no one was picketing as I had, probably unrealistically, worried about. We sat uncomfortably in the waiting area to get checked in. Once I registered, the staff seemed to treat us differently. Our ultrasound information was included with our paperwork and they knew this was a non-elective procedure. Even so, I sat for several hours in or on the verge of tears as we waited for my cervix to dilate. When it was my time to see the doctor, my eyes welled up and I followed the nurse. The doctor was very kind, as were the nurses. I had elected to have an IV during the procedure and I don’t remember anything other than the nurse brushing my hair out of my eyes and the doctor saying we were done. I was taken to the recovery area. The doctor came in after a few minutes to tell me that our baby’s anomalies had been easily identifiable, particularly the underdeveloped limbs. He said that that may make me feel better, which it did. Physically, I recovered quickly. Our baby’s condition was found so early that my milk did not come in after the procedure. Emotionally, several weeks later, I still well up throughout the day. I pray for my baby frequently, always in the morning and at night. I pray that our baby is in heaven. I pray that our baby understands that we wanted to free him from a flawed body that wouldn’t have allowed him to live. I mostly pray that our baby knows that my husband and I love him, now and always. I write this as a way for me to heal, but I hope that it may in some way make someone else’s similar journey a little more bearable. 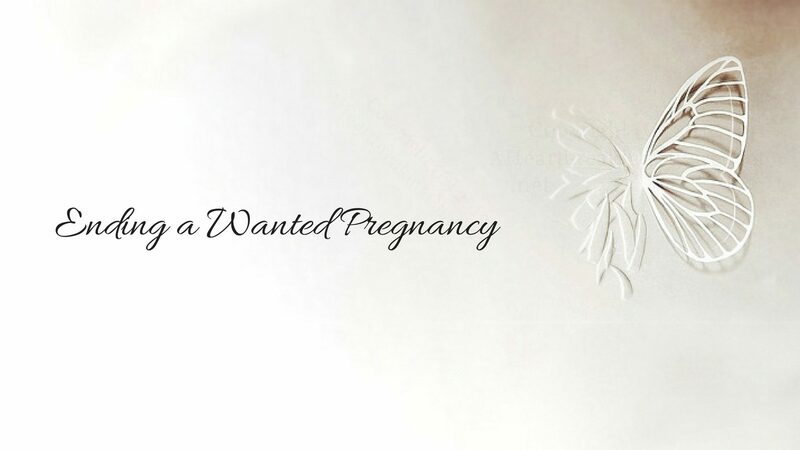 Ending a much wanted pregnancy is tragic and something I had not considered prior to being tossed into this nightmare. I hope that others are brave enough to share their stories publicly, as I am not. From our experience, there seems to be a gap in the medical field to help couples that are made to decide between two terrible outcomes. I hope this gap diminishes.